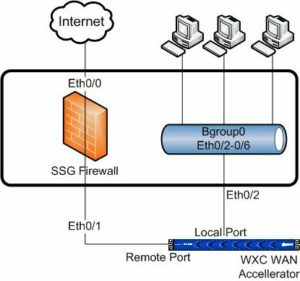 The WXC WAN Accelerator product can operate in-line or off-path mode. The in-line mode is simplest to setup where all traffic from the site passes through the device. Acceleration tunnels are created between the branch office device and the data center device. This in-line deploy on a branch firewall requires that all ports for the branch LAN be on the local port side of the WXC device. Generally this means only one port on the firewall will be used for the remote connection of the WXC and all local devices are then connected to switch(es) on the local interface side of the WXC. This design uses the ScreenOS ability to create layer2 groups of interfaces in order to isolate all available ports on the firewall and keep them on the local connection of the WXC. Thus all firewall ports are usable again. This also prevents the accidental connection of local computers or network devices on the incorrect side of the WXC and excluding them from the WXC acceleration tunnel. This configuration allows an IPSEC VPN site then to participate in the WXC mesh while preserving the use of all available ethernet ports on the firewall. When configuring interfaces on a WXC mesh be sure to select fixed speed and duplex whenever possible. For the SSG series this will be 100 full on the interfaces connected. This will avoid potential throughput problems that can occur when auto-negociation falls back to half-duplex. Verify the speed/duplex, ip address and zone assignment of the interface. Repeat with an ip address active on the LAN for the “local” port.